In a sandwich ELISA, two antibodies are required, commonly referred to as a “matched pair.” Each antibody binds to a different epitope of the target/antigen and when complexed form a “sandwich.” Requiring two antibodies increases the difficulty of developing the assay but also yields a more specific assay. Matched antibody pairs used in CST ELISA kits1 are optimized with predetermined amounts of capture and detection pair for each target. CST validates that each antibody and kit is reliable and provides reproducible results. Both monoclonal and polyclonal antibodies can be used in ELISAs, but each provides certain benefits that can be utilized to the experimenter’s advantage. Monoclonal antibodies are specific to a single epitope, eliminating any chance of interference with the binding of other antibodies to other regions of the antigen. They are also less likely to bind nonspecifically to other antigens. Therefore, monoclonal antibodies can be used in all steps of an ELISA and are particularly useful in sandwich ELISAs as part of a matched pair of noncompeting antibodies. Most CST ELISA kits2 are designed using monoclonal antibodies and provide robust and reproducible results for a variety of research topics. Polyclonal antibodies refer to a collection of antibodies that may bind to different regions on the same antigen. While monoclonal antibodies exhibit a higher degree of specificity, polyclonal antibodies may yield more robust signals due to their ability to bind at multiple epitopes. There is a variety of buffers needed for an ELISA experiment, including lysis3, coating, blocking, washing, dilution, and detection buffers. While basic recipes for these buffers are available individually, most are also commercially available in order to streamline experiments and to expedite, simplify, and standardize the procedure for each type of ELISA. These buffers have been developed to increase specificity, reproducibility, and sensitivity and to minimize cost. CST provides researchers with a line of ELISA products that are produced and thoroughly validated in-house to ensure the highest possible product quality and support. CST buffers4 are optimized to be used with other ELISA kit components or any CST ELISA antibody pair, and they are sold individually as well as in kits. The coating buffer5 is required to stabilize the antigen or antibody in order to promote its passive adsorption to the microplate surface without changing the epitopes. Hydrophobic interactions between the amino acids and the microplate well results in the adsorption and immobilization of the antigen or antibody and can be influenced by several factors, including temperature, pH, concentration, and time. Blocking buffers6 are added after the coating buffer in order to prevent the nonspecific binding of detection antibodies to the surface of the microplate. These buffers should contain the optimal concentration of nonionic detergent and/or nonspecific proteins and should not contain components that will interfere with detection. Washing buffers7 are used between steps to remove any unbound material and need to be fully removed after use. These buffers should be at the correct pH and contain the correct amount of salts and detergents in order to reduce background noise and stabilize the antibody-antigen complexes. The number of washes, the length of each wash, and the amount of detergent in the buffer need to be optimized. Detection buffers8 are composed of the substrates needed for catalysis by the antibody-enzyme complex. Many of the substrates are affected by buffer conditions; therefore, the composition of other buffers in the assay must be considered in order to reduce nonspecific cleavage of the detection molecules. Microplates for ELISAs are available in a variety of formats including solid or strip wells. The most common plates are flat well bottom and can have 96 or 384 wells. 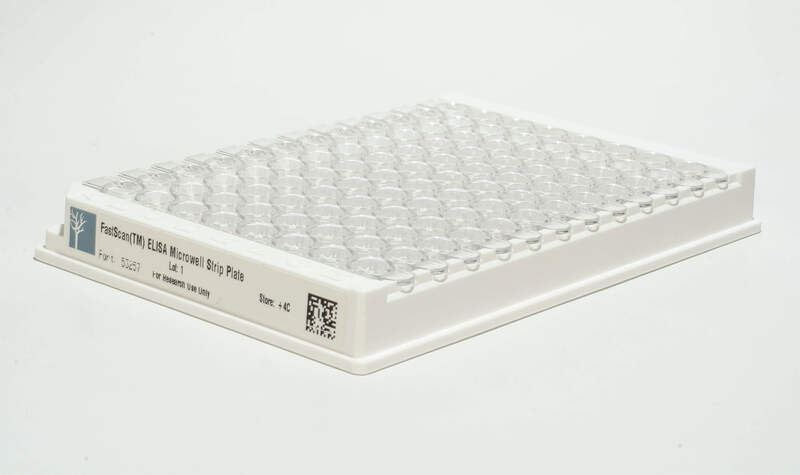 It is important to use plates that are designed for ELISA experiments, because they are manufactured specifically to allow for optimal conditions and to increase consistency between runs. The selection of a particular plate type will be determined by the type of ELISA to be run: colorimetric, fluorescent, or chemiluminescent. Colorimetric assays use clear well plates, while chemiluminescent ELISAs are run in opaque white, and fluorescent uses black plates to minimize background signal emission. The type of detection method used for an ELISA will determine the type of microplate reader required for measuring the signal output. Considerations for dynamic range and sensitivity of detection will influence whether colorimetric, chemiluminescent, or fluorescent reactions are utilized.